Body Transformation: Bigger With Age! Most people use their age as an excuse to be lazy, but not Steve. This guy got better with age in every facet. He’s racking up bodybuilding awards in his mid-40s! Like many kids today, I grew up watching superhero shows like Superman, Spiderman and Batman, all of which had extraordinary physiques. Unlike most of the kids in my neighborhood, I was not brought up in a sports-oriented family. Looking back, I was somewhat of an outcast when it came to sports. However, I got into fitness before the advent of most internet social media—a time when most fitness publications were in the form of books and magazines. The fitness magazines helped me realize that reaching an extraordinary physique, like the action heroes I admired as a kid, was within my reach. After reading numerous books and articles and years of trial and error, I realized I didn't have to come from a sports background or be young to obtain an extraordinary physique. In 2000, at age 34, I entered the Body-For-Life EAS Physique Transformation Challenge. I believe there were nearly 400,000 entries. I didn't win that challenge, but I know I was close because my before and after photos were featured in my favorite fitness publication at the time, Muscle Media Magazine. I couldn't believe a guy like me, with no real sports background, was chosen to be in the magazine. I was determined to make health and fitness a way of life. However, in 2005, I injured my cervical disk (the neck portion of my spine) and experienced the most excruciating pain of my life. Several doctors recommended surgery, but I avoided surgery like the plague and researched every method to rehab myself, including spinal decompression, epidurals, and physical therapy. I took three years off from weight training to recover and became out of shape. At age 44, I had enough. I was determined to get in the best shape of my life and prove it could be done. I stumbled across BodySpace in a similar way I stumbled across the Body-For-Life Physique Transformation Challenge and Muscle Media Magazine. Bodybuilding.com and BodySpace was the modern day version and it opened up a whole new world of inspiration for me. In August 2010, I created a BodySpace account and posted a pictorial play-by-play of my transition for the next 12 months. As I mentioned, at age 44, with significant experience behind me, I set out to get in the best shape of my life. After becoming a BodySpace member and reviewing other profiles, I noticed that guys with the physique I wanted were mainly young men's physique competitors. 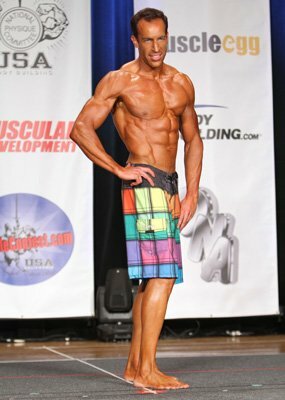 Just a few years ago, I would've never in a million years considered posting pictures of myself on the internet, let alone stepping onstage to compete with guys half my age in a bodybuilding contest. But that's precisely what I did. After seeing the other BodySpace profiles, that was it for me. I decided that age was not going to hold me back, and in January 2012, I took the leap and entered my first NPC competition at age 46. I took all my knowledge about the process of transformation and put together a comprehensive written plan on both training and nutrition. I wrote down each day's training and prepared one week's meals in advance, weighing all my protein and carbs and measuring out every macronutrient. I'm not suggesting you have to weigh your foods, count calories, or compete, but for me, having a very tight career schedule, a wife, and a family, I needed to be highly organized and structured to make this work. The key is that I set a self-perpetuated goal for myself. Once I set this goal, I let everyone know about my decision to compete and there was no turning back. Setting a goal in this manner worked well for me. It gave me purpose and a clear direction. I knew where I was and where I wanted to go. Success didn't come easy. I placed seventh in my first competition at the Ironman Natural at the LA Expo. I didn't have it nailed. At the Expo, I met several people who influenced my journey moving forward, namely Darren Conroy and Steve Cook at the Bodybuilding.com booth. I later met Craig Capurso online and Chris Cormier who gave me a training session at Gold's Gym Venice Beach. The most influential person, however, was a girl I met backstage who later became my competition prep coach. Despite what I considered a failed competition, I wanted to turn my defeats into triumphs. And that's exactly what I did. Carla Maria Cadotte was the person who guided me through my diet leading to my next competition in May 2012 where I took home three trophies at the 2012 California State Championships. 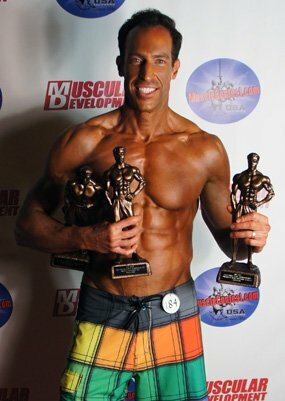 I'm setting my goals high again because I entered the 2013 BodySpace Spokesmodel Search. Thank you for letting me share my story with you. I plan to continue making progress and sharing what I learned along the way. I hope I inspire and motivate you to take action and improve. It's important to supplement on a calorie deficit while weight training because you won't get sufficient nutrients from whole foods. Furthermore, you'll include a high amount of daily protein which can be taxing on your liver. The listed supplements are intended to include liver and digestive support, prostate support, stimulate natural fat burning, naturally increase the body's production of testosterone, stimulate nighttime hormone secretion, and support proper immune system function. This particular meal plan corresponds to my diet and photo taken on April 21, 2012 (see progress photos on my BodySpace page). My nutritionist continued lowering my calories (slowly) thereafter for a cutting phase in preparation of an upcoming competition. I used the diet on this particular date as my example because my energy level was still good during this part of my cutting phase. My diet consists of two high-carb days per week and five low-carb days. The two samples below are a low-carb day and a high-carb day. For a detailed day-by-day diet sheet leading to the day of my competition, leave me your email address or contact me through BodySpace. Here's what I've been doing since February 2012. It really helped improve my symmetry. I usually split up my cardio from my weight training. I train in the morning and do cardio at night, usually alternating between treadmill and StairMaster three times per week for about 40 minutes. At 10 weeks pre-competition, I gradually increase to four days a week with two one-hour day sessions, and two high-intensity interval training days for about 25 minutes each session. I always warm-up with light cardio for 5-10 minutes prior to weight training. All listed exercises can be best viewed on Bodybuilding.com's exercise database. Hint: get the app and bring your cell phone to the gym. Below is a one-week sample of my favorite workout. If you want my full four-week program that shocks your body each week, please see my BodySpace or email me for an easy to use spreadsheet of my plan. Set a goal and don't be afraid to step out of your comfort zone. This is about change. Keep yourself motivated by challenging yourself. Plan your training and meals in advance. If things aren't working, write your plan down. Measure or weigh your food and write down your training and adjust accordingly. Email me for an easy to use diet sheet that calculates macronutrients and a training plan that focuses on symmetry. Focus 90 percent of your efforts on diet and cardio and 10 percent on weight training. Know there's a scientific method to the madness and don't think for a minute that you aren't capable of achieving an extraordinary physique. Your meal plan should maximize energy levels so your training is effective. Science proves that frequent eating (six meals per day) keeps energy levels up. Watch out for the bro-science and stick to real world application of physique development. The "old school" is "the school". Read Burn the Fat Feed the Muscle by Tom Venuto. Don't fall into the "calorie-is-a-calorie" trap. What you eat is important. Stick with a healthy diet of low-glycemic index carbohydrates, healthier oils, and protein sources. Never have two high-carb days in a row. Plan your high-carb days when you train larger muscle groups like legs and back. If you want to compete, get a professional coach. In 2001, I appeared in Muscle Media Magazine featuring my transformation. 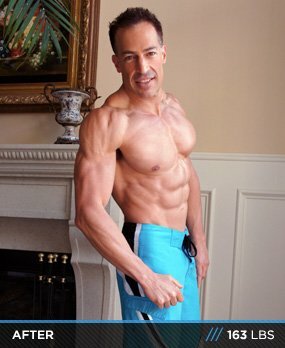 In July 2012, Bodybuilding.com featured me in "We 'Mirin Vol. 6 - 15 Must See Elite Physiques". On September 25, 2012, I reached 100 inspirational adds on BodySpace. To my competition prep coach and master nutritionist, Carla Maria Cadotte. To my personal trainer, Scott Zeller. To legendary bodybuilder, Chris Cormier, who helped me with pre-contest posing. To the many members who added me to their most inspirational list on BodySpace. 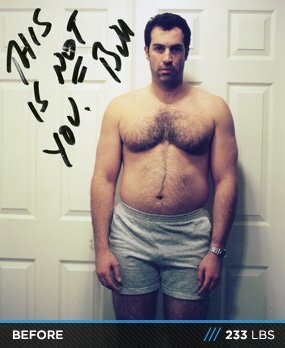 To my hundreds of friends on BodySpace. To the hundreds of individuals who provide positive comments and ratings on my gallery photos. To the hundreds of individuals providing very positive feedback regarding my transformation. To everyone who inspires me to keep going.